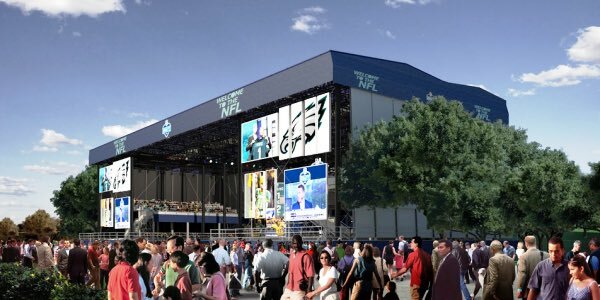 A rendering for the planned 2017 NFL draft shows how the famed “Rocky Steps” will be incorporated into the planned stage. The image which displays the plan was shown to an Philadelphia business organization group. Philadelphia resident Audrey Schneider‏ attended the Center City Propertiers Association Event. She shared the following image on twitter. The image shows that the main stage will be located towards the top of the iconic steps of the Philadelphia Art Museum, made famous by the “Rocky” films. The above image was shared with the media at a press conference where details of the draft experience were revealed. It is unclear if it shows the draft stage itself, or if it shows the selection square stage, which is where picks are actually made. Ricky “Reports” Sayer is a Harriton High School senior. He is attending Syracuse University in the fall.